Have you heard about The New Leadership Literacies? Effective leaders need to commit to managing their own energy, health, and wellbeing. That's not enough in today's hectic world. We need to do the same with our people and everyone that we have contact with day in and day out. 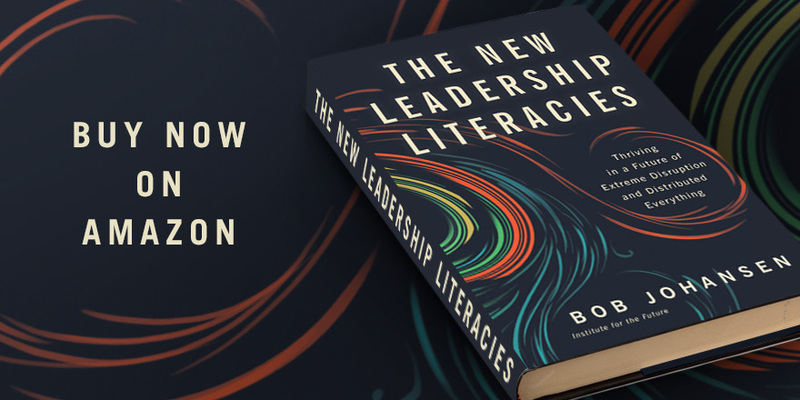 Following is a guest post from Bob Johansen author the new book The New Leadership Literacies. In 2010, I worked with Humana and Gallup on the topic of well-being, beyond just sick care. Gallup was just beginning its remarkable work on global well-being and Institute for the Future was focused on the future of what we started to call the global well-being economy. The last big economic driver was engineering and the digital economy. The next big economic driver will be biology, the life sciences, and the global well-being economy. Engineering will still be important, but it will be bioengineering. Building on that work and the work I’ve done since then, I’ve become convinced that well-being for leaders will involve so much more than not being sick. If leaders are going to thrive in a future of extreme disruption, they must not only manage their own energy, they must encourage, model, and reward positive energy in others. The tools for energy management are so much better now than they ever were—and they will get ever better over the next decade. Leaders have no excuse now. Fitness will be a price of entry for top leadership roles. Extreme fitness—physical, mental, and even spiritual (thought not necessarily religious)—will be required for most leadership roles. Mindful Well-Being: The good news is neuroscience will get very practical over the next decade. Leaders will have a wide range of new resources to help them develop brain-smart ways of leading. Interpersonal Well-Being: Family, friends, neighbors, and those with whom you have direct communications. As Charles Vogl said in The Art of Community86, interpersonal well-being is defined as the community of individuals who you feel you could call at 3am when you are crying. Societal Well-Being: How well linked are you to the culture, the society, and the planet around you? Well-Being in Work: When I was in divinity school, I was always intrigued by the notion of a “calling.” A calling is a strong urge, a push even, in a particular vocational direction. In a religious context, a calling often comes from God or a representative of God. I don’t believe that is always the case, but certainly a career calling is much more then a casual choice of what you want to do with your life. Leaders, particularly in a work-oriented country like the US, are at their best if they truly believe in what they are doing at work. Spiritual Well-Being: I mean having a sense of meaning in the face of a world of Volatility, Uncertainty, Complexity, and Ambiguity. Spiritual does not necessarily mean participation in any organized religion. While I am a student of world religions, I am not an advocate of any particular brand of religion. Religions can provide a sense of meaning for leaders, but there are many different approaches. The key is a sense of grounding, a sense of meaning that allows a leader to maintain a center in spite of being encircled by disruption. Meaning will be illusive in the VUCA World, but there will be a wide range of options for leaders to develop a sense of spiritual well-being, some personally uplifting, some socially constructive, and some downright dangerous. Bob Johansen is a distinguished fellow with the Institute for the Future in Silicon Valley. For more than 30 years, Bob has helped organizations around the world prepare for and shape the future, including corporations such as P&G, Walmart, McKinsey, United Rentals, and Syngenta, as well as major universities and nonprofits. The author or co-author of ten books, Bob is a frequent keynote speaker. His best-selling book Get There Early: Sensing the Future to Compete in the Present was selected as one of the top business books of 2007. His latest book is The New Leadership Literacies: Thriving in a Future of Extreme Disruption and Distributed Everything discusses five new leadership literacies—combinations of disciplines, practices, and worldviews—that will be needed to thrive in a VUCA world of increasing volatility, uncertainty, complexity, and ambiguity.